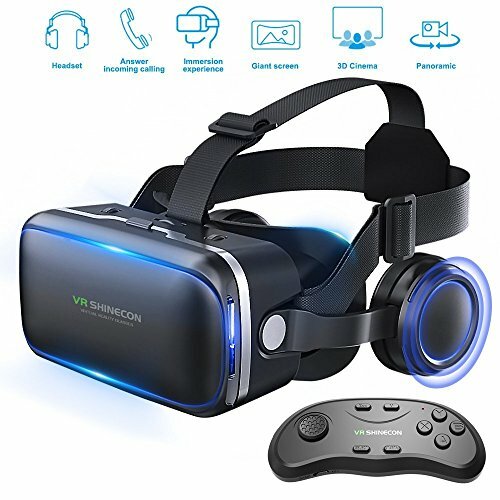 VR Shinecon use quality leather and powerful elastic sponge to create the cushion, touch your face friendly. Quality leather makes your face "breathe", no more just too fuggy to use. Then Powerful elastic sponge absorbs all weight from VR. Furthermore, Enlarged and deepened nose part is designed for fitting people's nose perfectly to avoid nose pain problem. The left button set for video/music play and pause, Volume+, Volume-,answering and rejecting calls. The right button is Touch screen button for shooting games only. Adjustable separate focal distance: alleviating the feeling of eye fatigue. VR Shinecon with this design can make you phone cooling down quickly. No more stop phone working cause of heat problem. Long time using with this ventilation design. Latest Version of VR - we not only reduce the volume and weight , but also pay more attention to internal component. We went on to conquer multiple barriers to obtain very accurate fitting of parts. VR Shinecon with a new handheld controller that seamlessly responds to organic, human movements in virtual experiences. Eyes Protection & Comfortable - HD resin aspherical lens are updated to be more smooth and purified. It can completely eliminate the feel of vertigo and provide you high-resolution imaging and the color visual event. It has soft and breathable leather padding keeps you feeling good even after hours watching. The small volume and lightweight gives you lots of comfort while using or wearing. Fits Most Smartphones - Comfortably fits Android phones and other smart phones with a screen size within 4.0 - 6.0 inches. Like iPhone 5/SE/6/6s/7/7 plus; Samsung S5, S6, S6 edge, S7,S7 edge, Note 4, 5; LG G3, G4, G5, G6, V10, V20; Nexus 5, 6P etc. If you have any questions about this product by Betolye, contact us by completing and submitting the form below. If you are looking for a specif part number, please include it with your message.